(Arutz Sheva).Republican National Committee Chairman Michael Steele spoke recently at the Israel Day Concert in New York. Steele spoke of America's ties to Israel in faith, in freedom, and in destiny, and slammed the Obama administration for “dithering” while Iran arms itself. It is a real honor and real pleasure to be here with all of you this afternoon. These are sobering times, these are important times, and I am just really grateful to be able to take a moment to share a few thoughts. First I want to thank Joe Frager for the opportunity to be here. What an incredible effort, Joe. Congratulations again for bringing all the community together. And to Danny Dannon - thank you so much for your leadership in the Knesset. I’m looking forward to joining you in Israel soon so that we can continue the hard work of raising the flag around the world about Israel’s security. Ladies and gentlemen, every generation in each century of American history, the greatest of American patriots and leaders - Adams, Lincoln, Reagan - have linked the heart of America to the cause of Israel. Why? What is it about America that so deeply connects us to Israel? There are many possible explanations: our shared moral code, rooted deeply in Mosaic law, our common history as nations founded by those seeking refuge from religious persecution, our democratic political systems, our free market economic systems, our shared commitment to equality, tolerance and generosity in the face of less than generous treatment by others. With all this in common, it is no wonder that we share not only a deep friendship, but we also share enemies. There are many who hate and envy both of our nations, our freedoms, our values, our very existence. The same villainous characters around the world and throughout history have targeted US and Israeli interests, including the Nazis, the Soviet Communists, the Islamic Radicals. Wherever there’s a titan of tyranny anywhere in the world, he hates America and he hates Israel. What is it about this tiny country, barely holding on to a little strip of land, that so provokes the powers of evil on the earth? I would argue that it’s not just political or historical or ethnic differences driving this animosity. I believe that the presence of the Jewish people, the very presence of the Jewish people, surviving all horrors, thriving in the midst of constant terror and attack, does indeed serve as a rebuke to the nations; because her nationhood, her continued blessedness, despite all the curses that man has spewed and inflicted, is an irrefutable manifestation to the watching world of G-d’s covenant with the people of Israel. You see, some would argue that we share interests with Israel. I would argue that we share faith with Israel. As modern man becomes increasingly secular and forgets G-d, the nation of Israel is a stark reminder that Israel’s G-d has not forgotten man. Americans are a deeply religious people, with most of us rooted in a Judeo-Christian tradition. As such, our bond with Israel isn’t just on a political or economic level. Our bond is spiritual. As Ruth said to Naomi in the Hebrew Scriptures, so America says to Israel, “Where you go, we will go, your people will be our people, and your G-d our G-d.” That is why we have stuck so closely together all these years. We have always known that our fates our linked. Ever since the founding of Israel in 1948 and the recognition of her by the US eleven minutes later, America has been a reliable friend, ally and partner in the struggle for Israel’s survival. The world has also always known: you mess with Israel, you mess with America. You try to wipe out seven million Israelis, you better be prepared to take out three hundred million Americans as well. That is why America has said repeatedly that vicious and dangerous regimes like Iran will not, on our watch, develop the capability to carry out their clear and unmistakable threats to destroy Israel and her people. That is, until now. It grieves me to the core to have to admit that today the American government has abdicated her traditional solidarity with Israel. Today Israel truly stands alone among governments, facing existential threats more dangerous and more imminent that ever before. That’s not to say that Israel has been abandoned however by the American people, but there is no denying that the current administration and its congressional collaborators have left Israel to fend for herself. Now I’m talking about, of course, the grave and gathering threat in Iran. This threat has never been more urgent and more important, and the US response to such dangerous intentions has never been so timid. We all know the stakes. Iran’s rulers have repeatedly and unashamedly threatened to eliminate Israel and are aggressively enriching uranium to that end. But our intelligence efforts are so tepid that we can’t tell you whether or not those nuclear weapons will be developed within a year or five years. Undoubtedly, Iran is the most dangerous threat to the world. As Israel implores the international community to take action, what is America’s response? Well, we are governed by a modern day Neville Chamberlain, constantly issuing assurances of coming peace filled with Orwellian doublespeak about not tolerating a nuclear Iran, while simultaneously abandoning every possible point of leverage that can be used to bring Iran’s nuclear program to its knees. World governments know Iran’s economy is in the tank, but this administration’s policy towards Iran is so upside down that President Obama is more likely to offer Iran a Greece style bailout than use Iran’s economic vulnerabilities to put a stake in the heart of her nuclear ambitions. And still the Obama administration dithers. The president shuts down Washington DC for days on end to hold nuclear summits that aren’t attended by the world’s actual nuclear threats and result only in promises by that rogue regime to the north, Canada, to turn over its uranium. All this would be laughable if it wouldn’t be so deadly serious. And the seriousness is felt no where more than in Israel. About five minutes after Iran acquires a nuclear weapon Israel will be bombed. Period. This is an absolute certainty. Iran is not restrained by any sort of instinct for survival the way the Soviets were. So we must take them at their word - they will attack. This is the cold, hard reality that the international community doesn’t want to face, because admitting it would demand action that is simply inconvenient. It would require ending lucrative business deals. It would require some sacrifice on the part of Europeans. If recent economic events are any indication then short term sacrifice to achieve long term goals seems not to be the modern European strength. It would require some unpleasant diplomatic pressure applied to China, which requires some fiscal restraint here at home, but given the leverage that we have given the Chinese with our debt and deficits that’s not likely to happen. It would require some unpleasant phone calls to Moscow, and liberals today still recoil at anything that would irritate the increasingly repressive, not so former communists in the Kremlin. All of this is embarrassingly awkward for the president. It has the added downside requiring this administration to stand for something resembling American values, including our traditional solidarity with Israel. It might even require some common courtesy the next time the Israeli prime minister visits the United States. It seems that all of this is simply too much to ask of this administration and those who have an appeasement first mentality. I say, no more! For the sake of Jerusalem, we must not be silent. For the sake of Jerusalem, we must no longer allow this or any administration to second guess the relationship between Israel and America. For the sake of Jerusalem, the world can no longer demand that Israel sell out the security of her people and make every concession in the book just for the off chance that a Palestinian leadership might show up at the bargaining table willing to recognize Israel’s right to exist. This administration has begun to make a different choice when it comes to Israel. The Republican party that I head sees only one choice - solidarity. Now I would argue further that the core principals of our party are inherently friendlier to Israel because they are based on the truth of human nature and good and evil. Republicans, unlike our utopian friends in Washington, recognize that there’s evil in the world, and it is emboldened rather than mitigated by concessions and appeasement. Republicans recognize that liberty will always cost something, but it’s always worth the cost. Republicans understand that the first and foundational responsibility of securing peace is securing strength. My friends, if Israel is to be safe, if Iran’s nuclear program is to be shut down, then we must recognize that not all political parties are created equally. Ideas have consequences. Elections have consequences. Elections more than ever are not just popularity or beauty contests. They are deadly serious contests of those ideas. Their results matter not just for America, but for the world. Israel’s survival requires an America that is strong and a president whose words have meaning and whose promises are kept. Former Secretary of State Condoleeza Rice said at the 2008 AIPAC policy conference that the only way we lose in the war on terror is if we quit, if we lose the will to support and promote our own values. Well, the only way Israel will lose is if we quit on her, if we lose the will to secure and support her peace. My friends, I cannot promise you the outcome of elections this November. I can’t promise what America will do or won’t do. There used to be a time when America could promise a solidarity with Israel. Even those days are starting to grow dark. However, I will promise you this: Republicans across this nation will continue to stand with our ally and our friend Israel, as we work to secure the future, not only for the next generation of Americans, but for Israel’s children and grandchildren as well. This is my prayer for Israel. I pray too that there will be a day when, as Golda Meir said, Israel’s enemies love their children more than they hate Israel. I pray that the G-d of Abraham, Isaac and Jacob will continue to bless his covenant people and that their survival and, indeed, their prosperity as a nation will continue to shame the enemies of freedom and unite Jerusalem forever. May G-d bless our nations and those who defend them. Shalom. Opposition Leader Tzipi Livni: "There was a need to stop these ships, it was not humanitarian mission"
(AFP).Prime Minister David Cameron urged his Israeli counterpart Benjamin Netanyahu on Monday to "respond constructively to legitimate criticism" of its storming of an aid ship bound for Gaza. Cameron told Netanyahu in a telephone conversation that Britain "deplored the heavy loss of life" after at least nine people died when Israeli commandos raided the ship. "He reiterated the UK's strong commitment to Israel's security, but urged Israel to respond constructively to legitimate criticism of its actions, and to do everything possible to avoid a repeat of this unacceptable situation," a spokesman for Cameron said. "The PM also stressed the importance of urgently lifting the blockade of Gaza, and allowing full access for humanitarian aid." (Ynet).The UN Security Council held an emergency meeting Monday evening, less than 24 hours after the deadly naval raid on a Gaza-bound aid flotilla. "What kind of Humanitarian activists demand to bypass the United Nations, the Red Cross, and other internationally recognized agencies? What kind of peace activists use knives, clubs and other weapons to attack soldiers who board a ship in accordance with international law? What kind of Humanitarian activists, some with known terrorist history, embrace Hamas, a terrorist organization that openly shuns a two state solution and calls for Israel destruction, defying conditions set by the international community and the Quartet? The answer is clear: they are not peace activists; they are not messengers of good will. They cynically use a humanitarian platform to send a message of hate and to implement violence." "Being a so-called humanitarian mission, these champions of human rights also rejected in the initial planning stage an Israeli request to ask Hamas to allow the Red Cross to visit captured soldier Gilad Shalit". Ben Smith Politico:"....indicates that the U.S. is taking its traditionally very different course from its European allies and others, who are condemning Israeli actions off Gaza as the U.S. affirms its relationship and withholds judgment.."
(Newsmax).President Barack Obama has agreed to reschedule a White House meeting with Israeli Prime Minister Benjamin Netanyahu in light of the deadly Israeli commando raid on ships bringing aid to the blockaded Gaza Strip. The White House said Obama talked by telephone with Netanyahu on Monday and that the president "understood the prime minister's decision to return immediately to Israel to deal with today's events." The statement issued by administration officials accompanying Obama on his visit to Illinois said the pair agreed to reschedule their meeting "at the first opportunity." It also said Obama expressed "deep regret" over the loss of life and cited "the importance of learning all the facts and circumstances" behind the incident. The Truth is the easiest thing to prove, but somehow this happens all the time, Israel losing the battle for the real truth in the International Media or laging time of response or lack of spokes people... Israel cannot afford to win the field battle but lose the PR Media battle. (DAVID HAZONY - Commentarymagazine).The details of what happened on the boat leading the flotilla trying to enter the Gaza Strip are still coming to light. CNN in the U.S. is speaking about “conflicting accounts,” though the videos it keeps playing seem to vindicate the Israeli side. (You see an Israeli soldier dropping into the deck, and then you seem him getting attacked. There is no indication that the IDF soldier had opened fire. The same video appears on an Israeli website here.) And yet, none of this has prevented worldwide international condemnation, including the hauling in of Israeli ambassadors in Sweden, Spain, and Turkey. And the grim results seem very clear: between nine and 15 people on board killed, and at least two Israeli soldiers in critical condition with stab and gunshot wounds. But beyond the question of what happened on the boat, and the more serious questions of the evolving nature of pro-Palestinian activism and the IDF’s apparent failure to prepare for a violent response, the event is also an important test case for how Israel is doing at adapting itself to the new rapid-information media world. The answer: so-so. On one hand, it’s clear that the Israelis, and especially the IDF, have made major advances in internalizing the message that the media battle is a crucial and — more often than not — decisive element in modern warfare. They released videos that would have remained classified not too long ago; they cleared a commando who took part in the raid to interview with the Associated Press and CNN; and they have emphatically made the case that the people on board planned to use force in advance. All these facts suggest a sea change in the way the IDF deals with the media, one that we already saw in the last Gaza war with the creation, for example, of a YouTube channel for the IDF. The result has been that, at least here in the United States, television coverage has been somewhat balanced. At the same time, Israel is still far behind the Palestinians in real-time rapid response and pre-event preparedness. [Michael Rubin-NRO].As we near the first anniversary of President Obama’s Cairo speech, the Middle East is heading to hell in a handbag. The core of the Obama doctrine is that “if we say what our enemies want to hear and if they like us, then our strategic objectives will naturally fall in line.” This of course is naïve in the extreme, but it has been at the core of the Obama administration’s foreign policy for the past year. Prime Minister Benjamin Netanyahu said Monday that he regretted the loss of life sustained by international activists after Israel Navy commandos stormed a flotilla bringing aid to the Gaza Strip, but said the Israeli troops who opened fire were justified for defending themselves. Netanyahu, who earlier in the day canceled his planned visit to Washington where he was to meet with U.S. President Barack Obama, said that Israel was prepared to bring all humanitarian aid carried on the ship to civilians in Gaza. He also said that Israel's blockade of the Gaza Strip would continue. Netanyahu was in Ottawa when the incident took place early Monday, and announced that he would return to Israel following his meeting with Canadian President Stephen Harper. Netanyahu spoke by telephone with Obama prior to his departure to explain why he had decided to cancel their meeting, The two planned to coordinate another date for their talks, and Netanyahu promised to keep the U.S. president updated as developments unfolded with regard to the Gaza flotilla incident. Khaibar is the name of the last Jewish village defeated by Muhammad's army in 628. Many Jews were killed in that battle, which marked the end of Jewish presence in Arabia. There are Muslims who see that as a precursor to future wars against Jews. At gatherings and rallies of extremists, this chant is often heard as a threat to Jews to expect to be defeated and killed again by Muslims. (JSSNews March 22/'10 - Translated from French via google).Only three days after a man was killed by a Qassam rocket into southern Israel, the UN Secretary General Ban Ki Moon, visited the Gaza Strip Sunday morning. In his speech to the people, he proclaims loudly to Gazan "We are with you" Mr. Ban called for an end to the seat that is also called "blockade" - the territory controlled by terrorists. We must therefore now ask what Ban Ki Moon refers when, in 2009, 738,576 tons of humanitarian aid was transferred to the Gaza Strip. Is the United Nations can truly say there is a "blockade" in Gaza while the international institution transferred nearly 200 million just after the operation Cast Lead. An operation that would have died in 1300. 200 million for 1.5 million inhabitants, therefore, against just 10 million for a natural disaster in Haiti that killed 230,000 people and in destroying the lives of three million others. Of course, no mention is that Haitians have not reached worn once to a nearby civilian population in recent decades and the number of natural disasters on the region has been unprecedented. The international community has bought this lie in bold false Israeli blockade of Gaza while ignoring the facts on the ground. International humanitarian aid has flooded quickly in the Gaza Strip for years and did not even arrested after Operation Lead Cast since no less than 30,576 trucks have entered the territory in 2009. That same year, 4883 tons of medical supplies entered Gaza with tools of high technology, including the last scanner on the market, the CAT scan (which came last month in Gaza). Moreover, the Gaza Strip has been called "the biggest prison in the world" for nothing. This induces the innocent to think that the population is unable to leave the territory. In 2009, 10,544 patients, accompanied by their escorts entered Israel to enjoy free medical treatment. SEO residents being unable to leave the territory in 2009, 10,544 patients and their companions have left the Gaza Strip for medical treatment in Israel. In recent weeks, more than 500 Gazans were treated summers in Israel. The United Nations continues to promote the lie of a "besieged Gaza," while hiding as best they could, the total amount donated in Gaza since the end of Cast Lead. In a report by UNRWA to measure the progress of UN aid six months after the military operation in January 2009, we could then see that the 300 million pledged over $ 200 million had already been transferred. they reported that the target of more than 300 million dollars they intend to give in Gaza, they transferred nearly 200 million dollars. Before his current visit to Gaza, Mr. Ban Ki Moon had to revisit the desolate land of Haiti. There, he promised to help more people and declared that the UN set up a plan to raise 1.4 billion dollars. This goal has not yet been reached but that does not care, since late January, we have already found 10 million for overall support. The main U.S. government officials and members of Congress (as Brian Keith Ellison and Baird) visited Sderot with the Sderot Media Center . Nevertheless, they continue to promote the false notion of "blockade". They are certainly aware that the Secretary of State Hillary Clinton has pledged 900 million dollars in material aid (specifically American) since the end of Cast Lead. In a report by USAID and the U.S. Department of Defense, the calculated total aid sent after the earthquake in Haiti (last month) is just over 700 million. Nearly 200 million dollars less than the assistance to Gaza and to terrorists who controls the territory. During the past year, the international community continues to speak of the "blockade" of Gaza, while reports of Sderot Media Center talking more than 330 rockets landed in Israel since the coastal territory. Spokesman Mark Regev on CNN: Leaders of the flotilla of wanting to provoke a fight. Defense Minister Ehud Barak said Monday that the organizers of the Gaza aid flotilla were to blame after at least 10 activists were killed when Israel Navy commandos stormed the ship. In a press conference hours after the incident, Barak said that Israel was prepared to accept the consequences of its actions and would continue to protect its autonomy. Barak voiced regret for the deaths, but called the flotilla a political provocation by and said the sponsors of the flotilla were violent supporters of a terror organization. "The State of Israel appealed to the organizers before the ships set sail and during the sail and invited them to arrive at the Ashdod Port and transfer the aid to Gaza after security checks," he said. "All of our appeals were turned down. The soldiers were attacked after arriving at one of the ships. Some were injured by serious physical violence on the part of the protestors. "I am familiar with these types of operations and their possible developments, and I am familiar with the units which operated and with their commanders. They are the best of our people," the defense minister explained. Israel Defense Forces Chief of Staff Gabi Ashkenazi, meanwhile, said the soldiers were forced by violent activists to respond with live fire. Deputy Foreign Minister Danny Ayalon said earlier Monday that the organizers of the Gaza aid flotilla have connections to international terrorist organizations such as Hamas and Al-Qaida, and called the aid convoy a violent and provocative attempt to break the blockade on Gaza. Ayalon, speaking at a press conference at the Foreign Ministry, said that Israel found weapons aboard the Gaza flotilla, which were used against IDF troops. The deputy foreign minister said that the Gaza flotilla did not heed Israel's calls to halt its movement toward Gaza on Monday morning, and stressed that no sovereign country would have allowed such a provocation to take place. "We couldn't allow the opening of a corridor of smuggling arms and terrorists," said Ayalon. The deputy foreign minister told reporters that Israel does not want to fight with any country, but that the incident on the Gaza flotilla is not yet over. Trade and Industry Minister Benjamin Ben-Eliezer voiced regret Monday morning for deaths aboard the Gaza-bound ships. "The images are certainly not pleasant. I can only voice regret at all the fatalities," Ben-Eliezer told Army Radio. (Leo Rennert-AmericanThinker).The two contrasting faces of President Obama in his relations with Israel and American Jews were on full display this week. On Thursday, Obama hosted some 250 Jewish luminaries and high-achievers at an elaborate White House reception to mark Jewish Heritage Month. The administration pulled out all the stops to make this a memorable, first-ever event. It gave Obama another chance to pump up his charm offensive to persuade Jews who voted overwhelmingly for him to remain lined up behind him. The President spoke about the "unbreakable Israeli-U.S." alliance and pulled out his oratorical skills to dispel any concern that his administration might be going wobbly on Israel. But even as Jewish leaders basked in the glow of the White House, the president's diplomatic team was busy in New York cutting a nuclear deal at the UN with Egypt and other Arab states that stabs Israel in the back. With U.S. support and endorsement, representatives of 189 nations adopted a nuclear non-proliferation declaration that calls for expedited action on a nuclear-free Mideast zone, with an international conference in 2012 to get this project moving to fruition. But even before 2012, the declaration already calls on Israel to sign the Nuclear Non-Proliferation Treaty (NPT) and invite UN inspectors' full access to lay bare its nuclear activities. Israel immediately rejected the NPT declaration as a "duplicitous" move against the Jewish state. Prime Minister Netanyahu's office denounced it for singling out Israel, while ignoring Iran. As an NPT non-signer, Israel did not participate in the New York conference. A Netanyahu spokesman said the prime minister intends to bring up Israel's objections when he meets with Obama at the White House on Tuesday. No other nation -- not Iran, which is moving to join the nuclear club and thumbs its nose at UN inspections; not North Korea, the No. 1 nuclear proliferator in the world -- is singled out in the NPT declaration. Only Israel, in a step widely and rightly regarded as signaling a direct threat to the Jewish state's ultimate deterrent -- is supposed to open its arsenal of nuclear weapons. Israel always has followed a policy of nuclear ambiguity -- its version of nuclear "don't ask, don't tell." Israel doesn't confirm or deny that it has nukes and, until this week, enjoyed full U.S. support in maintaining this guessing game. No longer. In backstage deal-making negotiations with the U.S. delegation, Arab states cooked up an NPT declaration designed to strip away Israel's nuclear veil of secrecy and deprive it of a nuclear deterrent against the likes of a nuclear Iran, which in the words of its own rulers, is determined to "wipe Israel off the map." Since NPT conferences can reach decisions only by consensus, every delegation in New York had to acquiesce. Each delegation had a veto. A single "no" would have killed the conference's declaration. Obama, however, went along, even going so far as to call the declaration "balanced" on wider non-proliferation and disarmament issues. But to protect his Jewish flank, he quickly put out a defensive statement that "we strongly oppose efforts to single out Israel and will oppose actions that jeopardize Israel's national security." Not to put too fine a point on it, this was a totally disingenuous ploy -- after the damage was done -- to remain in the good graces of Jewish voters and supporters. Because this clearly was a conference action that directly jeopardizes Israel's national security -- and Obama let it happen. If he didn't want Israel singled out, he could have prevented it and instructed his delegation to insist on removing any reference to Israel as the price of U.S. concurrence. Moving into full damage-control, Obama added that before there can be a nuclear-free Mideast region, there first has to be a "comprehensive and durable peace in the region and full compliance by all regional states with their arms-control and non-proliferation obligations." But this again was a U.S. afterthought that leaves intact the U.S.-backed declaration. For its part, Israel also happens to favor a nuclear-free Middle East once all countries in the region live happily and peacefully forevermore. The new U.S.-backed NPT declaration, however, attaches no such pre-conditions to its demands that Israel be required to sign on to the treaty whatever its own security implications might be in the meantime. Echoing his boss, National Security Adviser James Jones voiced "serious reservations" about the declaration's singular focus on Israel. U.S. Undersecretary of State Ellen Tauscher said the NPT declaration, which the U.S. had just approved, "might seriously jeopardize U.S. efforts to get Israel to attend the 2012 talks." Of course, Jones and Tauscher could have spared themselves any worries or the need to distance themselves from a document they had rubber-stamped if Obama had stood fast and insisted that the NPT conference treat every country alike -- i.e. not singling out anyone -- instead of putting Israel, and Israel alone, behind the eight ball. So we end up with a tale of two Obama personas -- the one that charms Jews at a gala White House event and the other that kicks them in the rear as they leave the premises. The following is a transcript of an interview by the CBC's Peter Mansbridge with Netanyahu on May 30. Mansbridge: Prime Minister, welcome to Canada. Netanyahu: Thank you. I'm absolutely delighted to be here and I mean it when I say it. Mansbridge: There are those who say that Canada is now Israel's closest ally. Netanyahu: It's pretty close, I have to say. Netanyahu: Well, I can tell you that I won't make comparative rankings, but we feel very comfortable with Canada. We're very proud of the fact that we have an increasingly strengthening relationship in every field — people to people, technology to technology, universities to universities, government to government. Stephen Harper has been a great champion of defending Israel's basic right to defend itself, fighting the campaign to de-legitimize Israel. People take note. They take note of the friendship of the government of Canada and the people of Canada. And I've come here to express our appreciation for that and to seek ways to work together for peace. Mansbridge: If we can talk about a number of the issues that are confronting Israel. Just the other day, Friday, the United Nations Nuclear Non-proliferation Conference suggested it wants to check, in effect regulate, Israel's nuclear capability. Do you buy that? Netanyahu: Well, I thought that was a particularly distorted and flawed resolution because it singled out Israel, the only true democracy in the Middle East and the only country anywhere on Earth threatened with annihilation. Yet it failed to mention Iran, which brazenly violates the Non-proliferation Treaty, is racing to arm itself with atomic weapons and openly expresses its wish to see Israel wiped off the face of the Earth. So they single out Israel, let Iran go. That tells you how distorted a resolution this is. And given the nature of this distortion, I don't think Israel will participate in the implementation of the resolution. Mansbridge: I want to get to Iran in a moment. But does the world have a right to know what Israel's nuclear capabilities are beyond energy? Netanyahu: The problem in the Middle East is not Israel. The problem of weapons of mass destruction in the Middle East is centred on those tyrannical regimes, or regimes that have supported terrorists, that have signed the Non-proliferation Treaty but has brazenly violated — beginning with Saddam, that is, Iraq under Saddam Hussein, which built a nuclear plant to produce atomic bombs, Libya which was very advanced in its nuclear weapons program, and Syria. And of course, most dramatically, Iran, which basically defies the entire world. So that's where the emphasis should be on and not on Israel. Israel doesn't threaten any country with annihilation. It doesn't seek to annihilate any country. Mansbridge: But I understand that. But there's a broader world out there and I'm wondering whether they have that right to know what your capabilities are. Netanyahu: Well, we're a responsible country and the important thing, I think, is that we understand that the problem of nuclear proliferation is a serious one obviously in the world, but it's not uniformly serious. It's very different if Luxembourg gets nuclear weapons — I hope I didn't make a — step on any diplomatic faux pas — or if the Ayatollah regime in Iran has nuclear weapons. The greatest threat to mankind today, and this is what we should be focusing on, is if a radical Islamic regime meets up with nuclear weapons or nuclear weapons meet up with a radical Islamic regime. The first is called Iran and the second is called the Taliban takeover of Pakistan. These developments could be a pivot of history. They could change the world. And I think if the international community wants to be concerned with the problem of what happens if these radical regimes acquire nuclear weapons, what happens if they give them to terrorists — these weapons could appear anywhere, they don't even have to have missiles, they could be put in a container on a boat without a direct address, they could appear in any country in the world — that is the single greatest threat of our time and that's what people should be focused on. Mansbridge: Let's focus on Iran for a moment. The Times of London has a report today that says that you're prepared to position Israeli nuclear submarines off the coast of Iran in the Gulf because of intelligence that you have — your country has — of missiles moving from Iran to Syria to Lebanon. True or not true? Netanyahu: Well, parts of this are completely untrue. What is true is that we are interdicting as best as we can the flow, a tremendous inflow, of weapons from Iran to their terrorist proxies, which is Hamas in Gaza and Hezbollah in Lebanon. They're shipping them thousands and thousands and thousands — tens of thousands of rockets and missiles — to fire on our cities, on our children. And we have been able to interdict. For example, one celebrated interception was on the high seas. We found a ship from Iran destined to Hezbollah that had 200 tons — can you imagine, 200 tons — just in one ship, of these deadly weapons that are aimed at civilians — and we took it away. But these are the ships that we intercept. I can't (overlap) … about those that we don't intercept. Mansbridge: But are you moving towards the Iranian coast? Because this will raise once again a number of issues: one, has talk worked against Iran? And two, the whole issue of pre-emption, still with talk. Has talk worked? I mean not just from Israel, but from Canada, the United States. Many Western countries have said similar things about Iran that you've said, especially about its president, [Mahmoud] Ahmadinejad. Has anything changed? We see protests on the streets of Tehran. Is that enough for you? Mansbridge: (overlap) But nothing has changed substantially with the danger has it? Mansbridge: So at what point do words not matter anymore? Netanyahu: This is a very pivotal question because I think you put your finger on it. There has been a move first to an understanding of the threat. That has happened in the international community. But there is a clear question of what do you do between understanding a problem and acting on it. It looks like the international community is going to pass sanctions in the United Nations Security Council. I think that's a symbolic action. I don't think it's going to have practical consequences for Iran. What is possible is to have much tougher sanctions that prevent Iran from importing gasoline or prevent it from exporting oil. That would have a stronger effect. Will it be enough to stop Iran's race for nuclear weapons, weapons they can give to terrorists that could threaten every one of us, including Canada? That remains to be seen. But I think what is required right now is for a decision to be made in the minds of the powerful and leading countries of the world. We will not let Iran develop nuclear weapons. Mansbridge: Well, I mean they seem to say that all the time. But, according to you, they still are. I just want to hit the pre-emptive note for a moment. Because I don't think you've ever publicly said you're for a pre-emptive strike on Iran. However, you have talked about pre-emption in general terms. And the last — I remember well because you and I talked about this in 2003 just before the Americans went into Iraq — and let me remind you of something you said, because I think it's prescient. “A pre-emption is the most difficult decision for democracies to make because you could never prove what would happen if you don't pre-empt.” Now, as it turned out, there was a pre-emptive strike. They didn't find weapons of mass destruction. Are you concerned at all that Iran doesn't have the nuclear capability that you fear it has in terms of making weaponry? Mansbridge: But are we at that point now? Netanyahu: That is true of nations too and certainly was true of the democratic world in World War II and it failed to recognize the danger in time. Mansbridge: But are we at that point now? It has been talk, talk, talk for longer than Britain was talking before the Second World War about the threat. Netanyahu: Well, there is talk and there is recognition and there is the question of whether there will be sufficient action. There's some action. The question is whether there will be sufficient action and I think that's — that's a question that's left hanging in the air. Mansbridge: Prime Minister, you wanted to make one other comment on the differences between the Iraq situation of '03 and today. Netanyahu: Well, I sat in the Israeli cabinet — I was foreign minister at the time — and I heard the assessments of Iraq's nuclear program. And we asked our intelligence people — this was before the American attack — do they have nuclear weapons, do they have biological weapons? And our intelligence people said, we don't know. We can't tell you yes, we can't tell you no. We don't have direct evidence. We think we might have it, but we can't prove that they have it. And if you asked us to sign off on it, we say we don't know. That is not the situation today with Iran. We do know that they have a nuclear weapons program. They themselves, the leaders, take journalists on guided tours of centrifuge holes. They're enriching their uranium to the high degree, very close to what is required for weapons grade material. We know they're building these ballistic missiles. What is that for? They say, well it's for medical isotopes. Right. So, you know, it looks like a nuclear program, it walks like a nuclear program, it smells like a nuclear program. It's not a duck. It's a nuclear program. It's a nuclear weapons program. And that we have no doubt whatsoever. Mansbridge: So what's the time frame? How much time have you got to stop it if it has to be stopped? Netanyahu: It's very close. I talked about it for the first time that I discussed it, which was about 14-15 years ago. It's moved up and it's finally getting there, you know. You say wolf, wolf, wolf and finally the wolf gets very close. They're very close. Mansbridge: Is that why you have submarines off their coast? Netanyahu: No, we don't have submarines, certainly we don't have nuclear submarines, period. You asked me about that. We don't have those. But we have, we share, we monitor what is going on and we share with other leading countries in the world what we find and coincidentally they share with us what they find. It used to be that we used to talk about Iran's nuclear program. They said, what nuclear program? Then they said, all right they have a nuclear weapons program but it's going to take them — we disagree on how many years it will take them to develop. All of that, as Iran gets closer and closer to producing this terrorist regime, this terrorist supporting regime is getting closer and closer to getting nuclear weapons — the main countries in the world agree on the facts. They even agree on the danger. What they now have to agree on is that they are actually committed to stopping this danger from materializing. Mansbridge: Prime Minister, I want to talk a little bit about the peace process. The other day you said you want to move to direct talks with Palestinians as opposed to the indirect talks that are kind of refereed by the Americans. Does that indicate the indirect talks have been going well or that they're not going well at all? Mansbridge: Who's we? You and Abbas, just the two of you? Mansbridge: But they set a condition on direct [talks] and that's the settlement issue. Netanyahu: Well, they never said that condition for the 16 years that we've had peace talks with the Palestinians. They all of a sudden decide in the last year when there's been a reduction in settlement activity — and I in fact put a temporary freeze on new construction — and they, instead of embracing these gestures, they actually put on more and more and more conditions, which are making it very hard to move towards peace. So you ask me what I'd like. I'd like a direct engagement, direct talks. Sit in the room with them, raise our concerns and basically move towards my concept of peace, which is a demilitarized Palestinian state that recognizes the Jewish state of Israel. We recognize the Palestinian state as the nation state for the Palestinians; they recognize Israel as the nation state for the Jewish people. After all, we've been around here some time, only about 4,000 years. They live there too and we have to find a way to live together. We have to talk to each other. Mansbridge: But aren't they still a subject if they're demilitarized? Netanyahu: No. Because the real problem is what happens to us if we just walk away? We walked away from Lebanon, we got an Iranian base in the north in Lebanon under Hezbollah. We've had 6,000 rockets fired from that base, Iranian base, on Israel's cities. We walked away from Gaza and Iran took that over with Hamas and we've had 6,000 additional rockets fired into Israel. Now I don't want that to happen a third time in the West Bank. I want to have an arrangement where if we make territorial concessions that this Palestinian state does not turn into a third base of Iran. Understand our problem; it's kind of hard to explain. If you reduce Canada to one-thousandth — not one per cent of its size — to about one-thousandth — one-tenth of one per cent of its size — that's Israel. I took my wife yesterday as a tourist. I went to the CN Tower, sat there, spinning around. You know, as we look into the horizon that's a lot wider than the state of Israel. I mean you can fit the state of Israel — the width of the state of Israel is much smaller than what you can see in this Greater Toronto region. So you have this tiny — imagine this tiny Canada sort of compressed into a width less than Toronto and now you build a state next to it. And that state can bring in weapons and fire 12,000 rockets into this Toronto? Would you accept it? You'd say no. I'm willing to do that providing there is a real demilitarization on the other side because there is no country that faces the kind of threats we face. So I think demilitarization is critical. Because our experience has been that without demilitarization, Iran just walks in, puts in thousands of rockets and missiles there and destroys the peace. Obviously we don't want that to happen again. Mansbridge: I'm running out of time. A couple of quick questions. Is in your view a two-state solution inevitable? Netanyahu: I think it's possible and it's the way to achieve this peace, if it's a demilitarized state, and if the Palestinian leadership does something it hasn't done up to now, which is to say, yes we recognize the Jewish state. We want a state of our own, a Palestinian state, but we want it not in order to continue the conflict, get rid of the Jewish state, the one and only Jewish state, Israel, but that this is the end of the conflict. Yes, Israel, we recognize the Jewish people have a right to a state of their own. We're not going to flood it with refugees. Palestinians will go to the Palestinian state. Jews can come to the Jewish state. That is the kind of solution that I'm looking for. And so far, because of the intimidating power of the radicals backed by Iran, the more moderate elements can't come and say this simple thing. I've spoken to my people this year and I said I will welcome two states for two peoples — a Palestinian state for the Palestinian people, a Jewish state, Israel, for the Jewish people. And the Palestinian state will have to be demilitarized so that — you know, it can change over time, you can test it, these demilitarization arrangements. But this is the formula: a demilitarized Palestinian state that recognizes the Jewish state. This is the winning formula for peace. Palestinians have yet to embrace the simple idea of saying that they will recognize Israel as the nation state of the Jewish people. That's perplexing. Mansbridge: If they do and they agree to the demilitarized state — with the concerns that I'm sure they will express on that — but if they did that's when Israel starts making concessions on land and territory? Netanyahu: It think it would be a tremendous leap forward. I think if we can actually overcome these two things. By the way, I don't place these as conditions for entering the talks. I say we should talk without pre-conditions. We should not place any conditions or impediments on having this kind of discussion. Mansbridge: You sound pretty convinced that those are conditions when you talk about a demilitarized state. Netanyahu: For finishing talks. We'll have other concerns with Palestinians, but how are we going to resolve these issues unless we actually talk to one another? I mean I'm delighted to talk to you, Peter, but I think it's no less productive, a lot more productive to talk to the Palestinian leadership directly, in the same room, because this is how we reach a solution. So I don't place any pre-conditions on entering talks. I have a clear idea of how we exit the talks successfully and I'm sure the Palestinians will bring up their own issues. But this is what we need to do, get into direct talks and resolve the issues of legitimacy and security. And I would add one other thing, which we're doing anyway — we're not waiting — and that's a third pillar of peace which is prosperity. In the short time that I've been in office, I've removed hundreds of roadblocks, checkpoints, Israeli checkpoints and roadblocks in the West Bank, facilitating Palestinian traffic, movement of goods, people. The Palestinian economy has shot up by eight per cent a year and it would not be in a position to do so if we hadn't relieved these roadblocks. That's my vision of peace. I think an economic peace is not a substitute for a political peace but it sure makes it easier. It invests the Palestinian population, invests young people with a future and tells them, you can have a real future. There are shopping malls in the West Bank, cafes, e-businesses, a lot of things that are happening. It's exciting. It's the first time that it's happened. I'd like to see highrises sprout from the West Bank and not missiles and that's my vision of peace. And I think that this is something that can unite all of Israel and all the world with the help of Canada. Canada has been a tremendous friend. I appreciate Prime Minister Harper's desire to help in the peace process. I appreciate the straightforward way that he stands up for Israel when it's slandered and I look forward to talking to him about advancing peace with security and prosperity in our region. Mansbridge: All right, we're out of time. But help me with just one question. It's the role of much of the Western media in covering this story, because it's often criticized harshly that it's anti-Israel or anti-Semitic in its description of what is happening. Whenever I've been to Israel I watch an Israeli press that isn't shy about taking on its government and you know that well. Mansbridge: (chuckle) Is the Western media biased against Israel? Netanyahu: Some of it is; some of it isn't. But a lot of it is missing another story. The main story is no country is as tiny, so tiny, just a speck of dust compared to Canada, facing threats that no other country faces, having a history of the Jewish people not being able to defend themselves and being obliterated basically for six years without anybody lifting a finger — that's the Holocaust. Israel was born to change that and it is changing that. And people forget that, forget what we're facing. Mansbridge: But is challenging an Israeli position, is that anti-Semitic? Netanyahu: Well, they take the last reel of the movie without showing the whole reel. They don't show the pummelling of Israel cities and they don't show the effort we take to try to target the terrorists themselves. What the Hamas terrorists are doing, with Iran's support, is that they fire at our civilians by hiding deliberately behind their own civilians and we try to ferret them out. But obviously this tactic of hiding among civilians and then firing rockets, thousands of rockets against our cities, against our children, they do it deliberately because they know that the only way we can stop them is actually going after them. But you know how we do that? We make thousands and thousands of cellphone [calls] to the Palestinian homes and say, please get out. There are terrorists in your building. Get out because we want to take them out. But we want you to leave first. We sent millions of leaflets. We send text messages. I mean the former British commander in Afghanistan, Richard Kemp, said that — Col. Richard Kemp — he said that no country in the history of warfare has taken so much effort to put civilians, the enemy civilians, out of harm's way as Israel has. And yet Israel is brought to the dock, so is that unfair? Absolutely. Is it a distortion of truth and justice? Yes. So we do stand up and defend ourselves. Let me tell you the one area where I think there has been the international press just missing out completely. We talk and it's natural, about Iran, about the peace process, about terrorism. These are big issues and they deserve to be discussed. But there is one other big issue that is happening below the radar. We've just been accepted, Israel, to the OECD as one of the developed economies of the world. Sixty-five years ago when Israel — 62 years ago when Israel was established, we had nothing — sand, swamp — nothing. Now we're one of the advanced economies in the world. Israel produces more technological products, conceptual products per capita than any other country on Earth. There's an explosion of thousands of startup companies. Canada has quite a bit of that as well. The future belongs to those countries that can produce products of the mind. That's a source of wealth much greater than oil or gas or coal. It's an enormous source of wealth. It makes our lives better. We make sure that we can live longer, more healthily. We can have productive lives. We can communicate with each other instantly. Israel's technology is in the forefront of all these things — energy conservation, brain research, miniature satellites, information networks. It's a tremendous story that is happening there with this tiny country, which has more companies on the NASDAQ outside the United States than any other country — I was going to say except Canada but I was just told that we beat Canada too. But we shouldn't be beating each other. We should be co-operating with each other. This is a story of a tremendous information and innovation revolution. It's the startup nation and we'd like to join forces with Canada for the coalition of the thinking. That's where the future belongs. (Theglobeandmail).Much has changed in the Conservative government’s foreign policy since Stephen Harper came to power in 2006. Suspicion of China because of its human-rights record has given way to enthusiastic courting of its business potential. Indifference to Africa has been replaced by a major commitment to promoting maternal health. Full-throated support for the mission in Afghanistan has become an unequivocal commitment to withdraw in 2011. But on Middle East issues, the Harper government remains an unswerving defender of Israel, even after the Obama administration replaced George W. Bush’s uncritical support with a more balanced approach that included sharp criticism of Israel’s ongoing settlements in the West Bank. Paul Kingston, a specialist on the Middle East at the University of Toronto, agrees. B’nai Brith, which advocates for Jews and for Israel, is taking out advertisements thanking Mr. Harper for “his principled and determined leadership of the Middle East file,” Frank Dimant, B’nai Brith Canada’s executive vice-president, said in a statement. Israeli Prime Minister Benjamin Netanyahu was given a Toronto Maple Leafs jersey during his visit to Toronto on Sunday, May 30. From the time Israel invaded Lebanon not long after Mr. Harper came to power in 2006, to Minister of State Peter Kent’s declaration in February that “an attack on Israel would be considered an attack on Canada,” this country has gone farther than any other in unstinting support of Israel’s actions. Critics maintain that Mr. Harper’s unflinching support for Israel panders to the religious wing within the Conservative Party, some of whose members believe that the unification of Israel is an essential precondition for Christ’s return, though others simply see Israel as a democratic bulwark in a hostile region..
Others believe the government’s stand is motivated by domestic political calculations. Others say Mr. Harper was simply acting on principle. A friend of Mr. Harper’s who has known him many years and doesn’t wish to be identified says the Prime Minister grew up in a household with parents who were appalled by the Holocaust and impressed on their son the importance of Israel as a refuge and a homeland for the Jewish people. 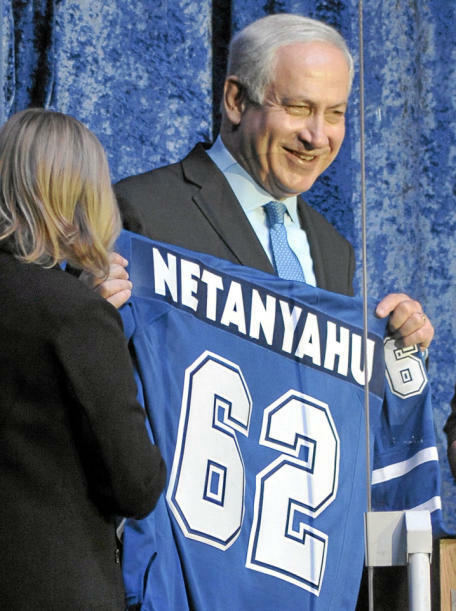 Nevertheless, in a hostile world, Mr. Netanyahu can take solace in knowing that, as long as Stephen Harper is prime minister, he can count on having Canada in his corner. Shalom Toronto.I am told that it’s been 32 years since an Israeli Prime Minister came to Toronto. Well, now everyone knows what they’ve been missing.To the thousands of people inside this arena and outside this arena, I want to say thank you. Thank you for one of the warmest receptions I have ever received. Thank you for what is surely one of the warmest receptions any Israeli Prime Minister has ever received.It is wonderful to be in Canada. The ties between Israel and Canada have never been stronger. I want to take this opportunity to thank Prime Minister Harper. Prime Minister Harper has been an unwavering friend of Israel. He’s a great champion of Israel’s right to defend itself. He stands against all the efforts to deligitimize the Jewish state.We deeply appreciate his support. I also want to thank the Canada-Israel Committee – a devoted group of leaders, both Jewish and non-Jewish, who work tirelessly to strengthen the bonds between our two countries.I want to thank the Toronto Jewish Community and the Toronto Jewish federation. 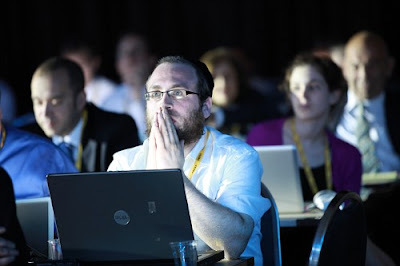 This community has a reputation for its passionate commitment to Israel. Year after year, you march for Israel. Year after year, you march for truth.Year after year, you show us that we are not alone.Though you are thousands of miles away, you are standing right by our side. Some Canadians do even more than that. A few weeks ago, I went up to Northern Israel to watch a military exercise. I met a young man named Jonathan Fader. He had a dirty uniform and his face was covered with camouflage paint. Story Jonathan came to Israel for the first time on a Birthright Trip. He eventually made Aliyah as part of Nefesh B’Nefesh. Jonathan is here with us today. Jonathan, please stand up. Thank you for defending the one and only Jewish state. Ladies and Gentlemen,I came here with a simple message: March with pride. March with clarity. Because what you are marching against and what you are marching for could not be any clearer. You march against those who hate freedom. You march for those that cherish it. You march against those who reject peace. You march for a people that have yearned for peace since the day Israel was born. You march against terrorists who target civilians. You march for an army that targets terrorists.You march against tyrannies whose laws repress women. You march for a country whose Supreme Court, like Canada’s, is led by a woman. You march against dictators who murder and torture their own people.You march for a liberal, pluralistic democracy. You march against those who glorify death. You march for those who celebrate life.You march for the values and ideals that Canadians and Israelis hold dear. Ladies and Gentlemen,Israel faces great challenges faced by no other nation. First and foremost is the challenge of preventing Iran from developing nuclear weapons. We must ensure that a regime that is the world’s leading sponsor of terrorism and shamelessly denies the Holocaust not acquire the weapons of mass death.Second, Israel must ensure that peace is anchored in security. We must not repeat the mistakes of the past. When Israel left Lebanon, Iran moved in. When Israel left Gaza, Iran moved in. We cannot afford to put a third Iranian terror base on the hills overlooking Tel Aviv. We must ensure that a future Palestinian state is effectively demilitarized. The people of Israel are prepared to make compromises for peace. But Israel will never compromise its security.And I will insist that just as we are being asked to recognize a nation-state for the Palestinian people, the Palestinians will have to recognize Israel as the nation state of the Jewish people. For there to be peace, the Palestinians will have to recognize the Jewish state once and for all. The third challenge for Israel is repelling the escalating attacks on our legitimacy.In the United Nations or on a college campus, we must fight back against the lies and distortions. We must learn the truth and defend it in every forum. The challenges we face may seem truly daunting. But if anyone here has any doubt about what Israel can achieve, think about what Israel has already achieved. When the State of Israel was established, only 5% of the world’s Jews lived there. Today, nearly half of the world’s Jews live in Israel. Israel began as a poor country with hardly any natural resources. Today, it is a high tech power. A few days ago Israel was accepted as a member of the OECD, the world’s most developed economies. Israeli technology is powering the world’s computers, our scientists are winning Nobel Prizes, and our doctors are curing rare diseases. Our agricultural know-how is irrigating arid lands and our expertise is bringing aid to disaster victims around the globe. Israel has defeated armies bent on its destruction, overcome terrorists that obey no moral code and fight the greatest slanders that have been directed against any people. Alone among nations, Israel is openly threatened by annihilation. Alone among nations, Israel must constantly defend its very right to exist. But Israel is also a nation that has defied the laws of history. After thousands of years, we restored our sovereignty in our ancient homeland, revived an ancient language, and ingathered exiles from across the globe. We realized the ancient dream of our people to rebuild Jerusalem, the eternal united capital of the Jewish people. Most important, we regained the power of self-defense after being a powerless people subject to every evil under the sun. Those who thought that the establishment of Israel would stop the attacks against the Jewish people were wrong. They did not stop. Not even for a single day.But Israel has given us the power to repel those attacks. There are those who want to strip Israel of that power. I promise you that they will fail. Israel will never, ever give up the power to defend itself. Third time looks like being the charm - Obama determined to present Netanyahu's visit as a success. ( Natasha Mozgovaya-Haaretz Blog).Third time's the charm, as they say. On Tuesday morning, Prime-Minister Netanyahu will land in the U.S. from Canada for his third visit to the White House. That same evening, he is due to leave Washington after another nearly spontaneous meeting with President Obama. But this time, there are whispers behind the scenes from all sides, even before Netanyahu's plane touches down at Andrews air force base in Maryland, that “it will be a successful visit”. Which means Netanyahu will finally get his photo-op, perhaps even a press conference with President Obama. Any prickly questions, if they are asked at all – on Israeli construction in East Jerusalem, for example – are likely be met with one of a trusted inventory of stock answers that have so long been the basis of Israeli-American diplomacy. “Sometimes even best friends disagree,” is a phrase likely to be heard around Capitol Hill next week; likewise, "this is an issue best left to final status negotiations". Less probable is the announcement of a breakthrough in U.S.-mediated 'proximity talks' between Israel and the Palestinians, begun about two weeks ago - although there may well be minor declarations on some bilateral cooperation projects in science and industry. What is new, however, is that unlike the last time Netanyahu was in Washington, the feeling is overwhelmingly positive. In the run up to the prime minister's trip, the White House held on Thursday held its first-ever reception honoring Jewish American Heritage on Thursday. The same day, the House passed resolution 1391 to congratulate Israel on its accession to the Organization for Economic Co-operation and Development. The vote passed unanimously with 418 votes in favor – a statistic that beggars belief in today's partisan politics – making the atmosphere almost festive. Conversations with Jewish leaders in the U.S. confirm the impression that attitudes have changed. “Relations between the two countries have progressed since the visit of Vice President Biden to Israel [marred by an Israeli announcement of building plans in East Jerusalem]”, said William Daroff, Director of the Washington Office of The Jewish Federations of North America, who held marathon meetings with U.S. officials to lay ground for the visit. “We are looking forward to building on the relationship, rather than getting stuck in a discussion that is no longer relevant”. Kathy Manning, chair of the Board of Trustees of The Jewish Federations of North America, told Haaretz that the Obama administration had taken concrete steps that had reassured American Jews. “The administration supported 'Iron dome' [an Israeli rockets defense system], and in terms of joint military exercises, it’s clear to us that the U.S. is very dedicated to this relationship," she said. "Recent steps the administration has taken to stop Iran’s nuclear weapons program and confront the de-legitimization campaigns seem to be increasing. These are real steps that were taken." She added: "The White House is very optimistic that there will be sanctions at the Security Council by June." Miller said American officials were making a "calculated effort to be nice". "It’s basically a virtue out of necessity," he said. "They have no chance to move forward on the peace process or gaining Israeli cooperation on Iran […] without forging a modus vivendi with the Israeli prime minister. It took them almost a year and a half to get there”. So all seems set for a resurrection of Israeli-American ties. Friday's closing declaration by the NPT review conference in New York, which singled out Israel for not signing the nuclear nonproliferation treaty and called for a 2012 conference on banning atomic weapons from the Middle East, could complicate things a bit. But it almost certainly will not be enough to spoil Netanyahu’s trip, hastily timed between visits by the Lebanese prime minister and the Palestinian president. Indeed, the White House is so resolved to make things different this time, that nothing could spoil it. B’nai Brith Welcomes PM Netanyahu to Canada; Netanyahu to join "Walk with Israel"
(YWN, Jpost)..B’nai Brith Canada has launched a national campaign to welcome the visit to Canada of Prime Minister Binyamin Netanyahu. “We decided to launch this campaign in order to welcome the Israeli Prime Minister to Canada and to commend the Harper Government for its principled and determined leadership of the Middle East file,” said Frank Dimant, B’nai Brith Canada’s Executive Vice President. “Canada and Israel are two democratic allies which in addition to standing together against the forces of Radical Islam, enjoy independent judiciaries, equality for all their citizens, a free press, and open elections. Residents of Toronto will get a chance to show their love for Israel on Sunday, when 15,000 people are expected to join the annual, daylong UJA Walk with Israel. The walk, whose proceeds will go toward projects initiated by the UJA Federation of Greater Toronto to help Ethiopian immigrants in Bat Yam, is going to have an added attraction this year: Prime Minister Binyamin Netanyahu, who will speak to the walkers before they head off on their routes on Sunday morning. “The timing is perfect,” said Amir Gissin, Israel’s consul-general in Toronto, speaking about Netanyahu’s visit to Canada. “Canada is today a very close friend of Israel, with both a friendly government and opposition. We just had the premier of Ontario, Dalton McGuinty, in Israel,” Gissin said. Netanyahu, who arrived in Toronto on Friday with his wife, Sara, was expected to meet privately with members of the Jewish community, as well as with selected members of the media during his stay in the city. “Looking at the list of the editors, broadcasters and writers he’s meeting with, you see quite an impressive list and one that reflects the interest Canada has in Israel,” Gissin said. Netanyahu, making the first visit by an Israeli prime minister to Canada since 1994, is scheduled to fly to Ottawa after launching the Walk on Sunday, to meet with Canadian Prime Minister Stephen Harper. President Barack Obama and senior US officials deplored Israel's mention in the resolution passed by the 189 Nuclear Non-Proliferation Treaty members Friday, May 29, which called for a Middle East nuclear-free conference in two years: "We strongly oppose efforts to single out Israel," said Obama, "and will oppose actions that jeopardize Israel's national security." Iran's chief delegate Ali Asghar Soltanieh said the Americans should "think twice" before making such statements. "This was not the right reaction to a positive response, positive measure by our delegation joining the consensus," he said. The US had "serious reservations" about the 2012 Middle East conference, said Jones. Its attendance would be voluntary "when all countries feel confident that they can attend," and the singling out of Israel by calling on the Jewish state to join the NPT and submit to UN safeguards placed the prospects of the 2012 conference "in doubt." The US moreover insists on a peace agreement between Israel and its neighbors being put in place before it is required to take steps on its unconfirmed nuclear arsenal. The 28-page statement by the NPT members called on all Middle Eastern states to attend a conference due to be held in 2012. It also went on to highlight "the importance of Israel's accession to the treaty and the placement of all its nuclear facilities under comprehensive IAEA (International Atomic Energy Agency) safeguards." Israel said Saturday that it has no intention to fulfill the decision of the Review Conference to the NPT, which calls on it to allow international inspection at its nuclear installations. "This resolution is deeply flawed and hypocritical," an official statement by the Prime Minister's Bureau read. "It singles out Israel, the Middle East's only true democracy and the only country threatened with annihilation. Yet the terrorist regime in Iran, which is racing to develop nuclear weapons and openly threatens to wipe Israel off the map, is not even mentioned in the resolution. The real problem with weapons of mass destruction in the Middle East does not relate to Israel but to those countries that have signed the Nuclear Non-Proliferation Treaty (NPT ) and brazenly violated it - Iraq under Sadaam, Libya, Syria and Iran." Despite signing the agreement, Washington has sharply criticized mentioning Tel Aviv in the statement. sources in Jerusalem expressed disappointed over U.S. conduct on the matter. A senior Israeli official described the American behavior as "surrender and bowing to pressure." The senior official said Israel has held intensive exchanges with the U.S. in recent days in an effort to foil the anti-Israel initiative, but the Americans chose to make a statement that fits the international consensus, even though this went against Israeli interests. "We have explained to the Americans over and over that preserving Israel's security is the most basic precondition for progress in the peace process," said a senior Israeli official. "This decision will make it difficult for us to do this." Haaretz reports: Prime Minister Benjamin Netanyahu will ask for clarifications about the U.S. position on the Non-Proliferation Treaty Review Conference when he meets with U.S. President Barack Obama at the White House on Tuesday. TIME: Bibi and Barack: Can They Bridge the Gap?